There was an owl named Jack. He lived in a tree. One day he got caught in a net by a hunter. Then we found him and took him back home. We put him back in his tree. He was happy. There was an owl named Jane. She lived in a tree. 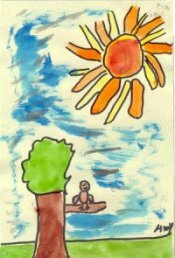 One day she flew to a friends house and played with her friend. Then she went home. She had fun. 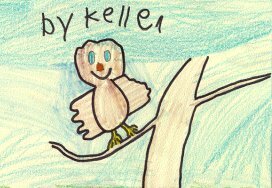 There was an owl named Kelsey. She lived in a tree. One day she went into the woods and she got lost. My friend found her and took her home. She was happy. Owls can eat a skunk and all rodents. They are quiet hunters. They hunt at night. They can turn their heads all the way around. Owls can fly by you without making a sound. They hunt until dawn. Crows are an owls worst enemy. 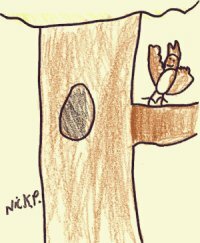 There was an owl named Nick. He lived in a red house. One day he got caught in a net. Then a man saw him and took him home. He was happy. 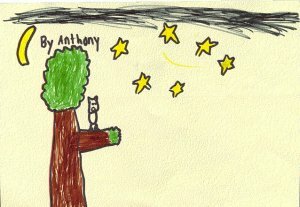 There was an owl named Matthew. He lived in a hole in a tree. One day he got caught by a bear. The bear wanted to eat him but he got away. There was an owl named Steve. 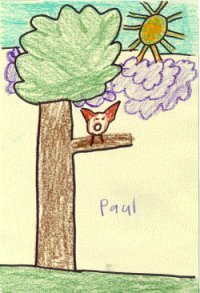 He lived in a tree. One day he was flying and he got his wing caught on a branch. A girl came and got his wing out. He was happy. Owlets cant see for 15 days. Owls swallow their prey whole then they throw up pellets. They hunt until dawn. There was an owl named Brownie. She lived in a tree. One day she was flying and she fell down. When she got up she could not fly. Then a doctor helped her get better. She was happy. Owls swallow their prey whole then throw up pellets. They have 4 toes, 2 in the front and 2 in the back. They hunt at night. 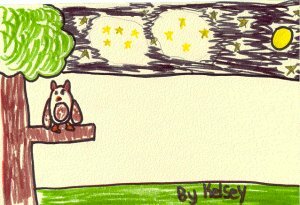 Owls hunt at night. Crows are an owls worst enemy. Big owls will hunt smaller ones. They have 4 toes, 2 in the front and 2 in the back. There was an owl named Max. He lived in a tree. One day he got into a fight with another owl. Then they became friends. They were happy. Owls swallow their prey whole then they throw up pellets. The pellets have the fur and bones of the animal they ate. Baby owls are called owlets. Owls can fly by you without making a sound. They hunt until dawn. Owls have good eye sight. Owls have 4 toes, 2 in the front and 2 in the back. Crows are an owls worst enemy. Owls have 4 long claws on each foot. There was an owl named Joey. He lived in a house. One day he flew out of the house and then he got lost. Then we found him and we took him home. He was happy. Into the branch in the wind"
Owls are birds that live in trees. Owls eat mice and other small animals. They hunt at night and see very good in the dark. The owl has a large head and eyes and a short hooked bill. We would like to take this opportunity to give a special thank you to our instructional aide, Lillian Naccarato. Lillian worked with our class to get all of our materials together. Way to go....Lillian!